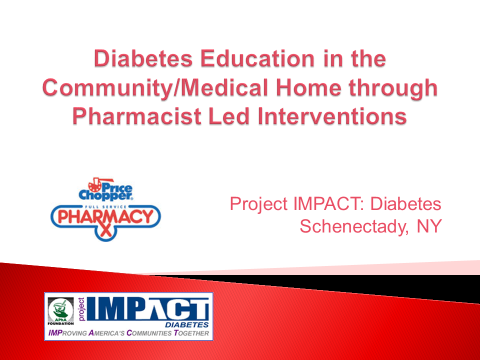 The key messages and focus of the presentation was to share Price Chopper Pharmacy programs and outcomes from Project IMPACT: Diabetes. The presentation included the process of care and role of the Price Chopper pharmacists and dietitians. It also included a review of clinical outcomes and discussion of barriers and opportunities learned from the experience. After the presentation, the presenters discussed next steps to implementing a program with attendees' health plans. Price Chopper Pharmacy has a plan to pilot a MTM Program focused on patients with diabetes, asthma and hypertension.